Gangster Squad is undeniably trashy, occasionally sloppy and never quite settles on a consistent tone but it's enjoyable enough in a forgettable Friday night thriller sort of way and it's ultimately worth seeing for the performances by Penn, Brolin and Gosling. 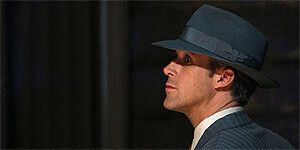 Directed by Ruben Fleischer, Gangster Squad is (very) loosely based on a true story and set in 1949 Los Angeles. Josh Brolin stars as ex-soldier-turned-hard-boiled-cop Sgt John O'Mara, who's hand-picked by Police Chief Parker (Nick Nolte) and tasked with assembling a secret police squad dedicated to destroying the sprawling L.A. operation of East Coast gangster Mickey Cohen (Sean Penn). With O'Mara's squad – including crack shot Kennard (Robert Patrick), technology whiz Keeler (Giovanni Ribisi), handsome charmer Jerry (Ryan Gosling), tough guy detective Harris (Anthony Mackie) and Kennard's loyal sidekick Ramirez (Michael Pena) – hastily assembled, the team set about dismantling Cohen's empire by bugging his house and hitting all his businesses. However, Cohen quickly suspects that the squad are cops and things are further complicated when Jerry falls for Mickey's glamorous girlfriend Grace (Emma Stone). Josh Brolin is suitably square-jawed as O'Mara, while Gosling seizes the opportunity to have a little fun with his dreamboat screen persona by giving Jerry an amusingly high-pitched voice. In addition, there's strong support from Ribisi, Patrick, Mackie, Pena and Mireille Enos (as O'Mara's wife), though the film is roundly stolen by Sean Penn, who delivers a deliciously over-the-top turn as Cohen and adds several enjoyably quirky touches, such as insisting on wearing a tie to a shoot-out or yelling ‘Here comes Santy Claus!’ before opening fire. The script is packed with pulpy dialogue that doesn't always come off (Stone and Gosling's seduction scene by the bar is downright embarrassing) but does a good job of setting a 40s/50s pace and rhythm. Similarly, the action scenes (shoot-outs, car chases, punch-ups) are both frequent and well handled, even if they are occasionally laughably improbable (good guys miraculously dodging hails of bullets etc). Let's be clear, Gangster Squad is no L.A. Confidential. Indeed, its main problem is that it can't quite decide whether it wants to be a serious police versus gangsters drama or surrender to its pulpier impulses and just let the bullets and fists fly while revelling in the gorgeous set design and costumes. Ultimately, the latter wins out, meaning that the film is definitely on the trashy side, but it's enjoyable enough if you don't take it seriously. The other main problem (particularly for fans of the Gosling/Stone pairing in Crazy Stupid Love), is that Stone's character is so underwritten that she might as well not be in the film, while the romance subplot never really convinces. Despite its flaws, Gangster Squad remains watchable in a disposable, pulpy sort of way, largely thanks to the stylish production design and a trio of enjoyable performances from Penn, Brolin and Gosling.